Every once in a while, I read something in the newspaper which either outrages me or which is misconceived. I used to let these go by, but of late I've taken to emailing the newspaper concerned (usually The Independent , which I began reading the from the day it came out - I have the first 15 copies hidden away in my attic somewhere). My hit-rate is surprisingly good - around 75%. The letters are normally cut down from the original, but I anticipate this by providing sufficient padding to give the editor some leeway (the letters aren't always cut, just usually - it depends on the space available). The titles are the newspaper's, which means that if mine is the second or third letter on a particular subject that day, it can be a little distant from what the heading implies. 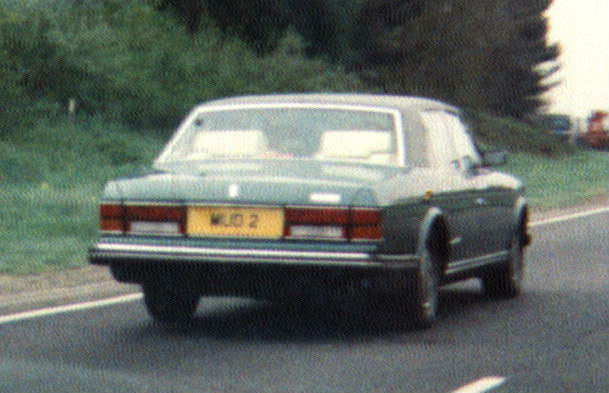 Eerily, I once find myself driving down the A12 to London behind the vehicle which has MUD 2 as its registration number: it's a light green Rolls Royce Silver Spirit. This was my attempt to correct a misapprehension on the part of the author of a piece about an encyclopoedia of art that "electronic rights" meant inaccessibility for all. My letter was pared down somewhat, so it seems like I'm saying all will be well when I don't necessarily believe it will be, but hey, I got my name in print! One thing that irritates me intensely is the way that all research which shows a difference between men and women is reported in The Independent from a "poor men" point of view. This letter was sparked by a particularly crass incident, where research had shown that women were supposedly hardwired to be "sensitive to others" whereas men had to learn it, the poor dears. Nowhere was it considered that it may sometimes actually be an advantage not to be hardwired that way, nor that being unable to override it may be a disadvantage. I was quite surprised when they printed this, given the venom I injected into it. This letter describes an incident where I was hit by a woman in a motorised wheelchair while reading a church noticeboard in Hammersmith (hey, I was 30 minutes early for an appointment, I had to do something). I knew it was just perfect for a letter to a newspaper, so I waited until the opportunity arose. Six months or so later, when the government had one of its periodic fits of safety-consciousness, it did. For some bizarre reason, the government decided to ban consumption of meat on the bone because there was a chance that up to 1 person a year could die from CJD having eaten it. This is despite the fact that there is compelling evidence that many tens of thousands of people will die every year from smoking cigarettes, yet they're not banned at all. This letter, although on the surface rather light, nevertheless makes what I consider a valid point: why shouldn't we be able to make up our own minds instead of being subject to official nannying? I knew they'd publish this letter, because it was high-impact and amusing. However, they toned it down to appear in print (in the original version, the last line had line had "to piss" instead of "where they get"). Of course, it does make a serious point: in a supposed super-state of 15 countries, why is one country, France, indulged when it comes to petty nationistic posturing, but other countries are routinely slapped down? The previous day, a report into electoral reform in the UK was published to great fanfare. It proposed a form of proportional representation for parliamentary elections - something I believe to be A Good Thing, and to which I am looking forward. A mere cursory glance at the favoured system, however, filled me with despair: it took all the best bits from PR and first-past-the post, threw them away, and put the residue together in what can only be described as "a dog's breakfast". I was particularly incensed by the use of party lists, which have to be one of the most undemocratic means of selecting candidates ever (even if there is the mollification of getting to choose one name from three in a second-tier ballot). I dashed off a letter proposing a hack to fix it, and it was published. There was some minor editing which made the second paragraph read a little strangely, but my point was not obscured by it. I was even mentioned in the next letter column by someone saying "Richard Bartle rightly suggests that the top-up MP should be the best runner-up from the appropriate party"..! Aside: delivery of The Independent was late that Hallowe'en, so my newsagent substituted The Daily Telegraph instead. Both of these published a letter from some guy in Wales also on the subject of the Jenkins Report, word for word the same in both newspapers except The Independent dropped the bit accusing Jenkins of leading a self-indulgent life. I thought I was keen to get into print..! "In brief" is where The Independent put(s) letters which are short and off-topic. I was almost certain they would place this one there - I knew it was ideal for publication. This was another short letter I was confident they would publish, although they skipped a day before they did and then they edited it down as much as humanly possible to fit it in (ideally, there would be a line break before the final two words). Still, there was a lot of news happening at the time (wars, bomb blasts, celebrity murders, local elections) so they were a little pushed for room in their letter column. This came only 6 days after my previous letter, albeit in the Sunday edition of the newspaper. I had a shrewd idea they'd publish it, its being one of those "raise a wry smile" letters they seem to like putting as the last one on the page. A letter to The Independent on 16th May described a "recently released transcript" of a radio conversation between a United States warship and Canadian authorities. It was basically a cut-down version of what can be found in many places on the net. I'd read it before, and was pretty sure it was false. A quick search revealed that it was indeed , so I dashed off a letter. Two days later, it was printed (although not including the URL I gave them, perhaps because it's critical of newspapers that reprint the story without checking it first...). Oh, they also changed "Burns'" to "Burns's", I expect to comply with some editorial policy they have on making words ending in s possessives. As a footnote, someone else wrote in asking how could I know the incident never took place because the Americans would never admit it. I wrote back explaining how I knew, but it was a letter that was never going to be published (sigh). I've never liked the idea that the people who have suffered from a crime should get to have any say in the punishment given to the offenders. Just because one person can bear their misfortune with stoicism, why should the perpetrators of a crime serve any less a sentence than if they choose someone as a victim who can burst into tears in court? Worse, in the case of murder it's the relatives who get a say in the punishment. I'm sure everyone with a spouse who hates them won't mind having them speak up in defence of the murderer... I was therefore aghast to see that the government was proposing to implement this odious practice. Even though I'd already had two letters published earlier in the month, I was pretty sure they'd put this one in, too. They did, the only editorial change being that they didn't italicise the word be near the end. Tip: mentioning the name of the newspaper in a letter seems a good way to increase the chances of its being published. Note: this letter was published 5 days after I sent it, which is much later than usual; I'd almost given up on it. Still, I quite like the fact that it made it into print on the first day of the third millennium - 01/01/01. The most sensitive issue in the Northern Ireland peace process concerns the decommissioning of paramilitary weapons. The IRA, while accepting the basic principle, showed themselves reluctant to hand their weapons over to the armed forces of any government. Instead, they offered to put their guns, bombs, rocket launchers, ammunition etc. "beyond use" - a mysterious phrase upon the meaning of which they have yet to elaborate. An article in The Independent relating the charges against three IRA members arrested in Colombia suggested to me a rather worrying possibility which I sincerely hope will not prove to be true. I dashed off a letter, and two days later The Independent published it (editing it down to about half its original length). On 8th March, 2001, I attended the launch of TIGA, the first computer games industry body in the UK that actually looked like it could be a success. Speaking there was the then minister for e-commerce, Patricia Hewitt. After saying we made more money for the UK than the film industry, chiding us for not employing more women, and tut-tutting over software piracy she'd seen in Singapore, she asked for questions. I got the last one, which caused the entire room to burst into laughter: "If this industry of ours really is as important as the film industry, how long will it be before someone in this room gets an OBE?". Of course, it did make a serious point, which the minister recognised. She invited me to e-mail her about it which I did. Whether this had any causal effect whatsoever on the OBE awarded 9 months later to Jez San for services to the computer games industry, I don't know; he certainly deserved it, whatever. Anyway, I included in my email a query regarding Tim Berners-Lee, the inventor of the World Wide Web. Ms Hewitt said she'd see if she could find an answer, but none was forthcoming so I guess she didn't. Consequently, when the January 2002 honours were announced and Tim Berners-Lee didn't get a knighthood (or anything else), I dashed off this email. They removed a line pointing out that it's Sir Geoff Hurst but only Bobby Moore, OBE (as he died too young), but that was deliberate padding on my part anyway in case they wanted something longer. I told you there was a long story behind it. PS: Tim Berners-Lee finally became Sir Tim Berners-Lee in the New Year's honours list for 2004. Politicians like people to vote. If people vote, it means that those they elect can claim a democratic mandate. It's hard to argue that you have the people behind you when 70% of the electorate fail to vote at all. Rather than view the root cause of this (ie. the feeling people have that their vote is worth nothing), politicians in the UK have instituted a number of initiatives to make voting easier - polling stations at supermarkets, all-postal voting, longer polling station hours etc.. None of these are likely to make much of an impact, however, so, New Labour decided to "open a debate" on the subject of compulsory voting. I am not in favour of forcing people to vote: the electoral system needs to be reformed, and papering over the cracks to give candidates some semblance of democratic legitimacy they don't deserve is only going to make it worse. Oh, and guess what? It's Labour voters who tend to stay at home on polling day, many of whom could ill afford to be fined £50 for not voting. I decided to write a nice, sarcastic letter to complain. The title, by the way, came because Hartlepool United's football mascot (a man in a monkey suit) had the day before been elected mayor of the city. The Independent printed 5 letters under this single heading, of which mine was the final, "humorous" anchor. Footnote: 2 days later I received a photocopied sheet addressed to "Richard A. Bartle, West Bergholt, Essex" from a group calling themselves "The Kentish Whingers Society". I've no idea why. For charity, ITV shipped eight celebrities out to the Australian rainforest for a fortnight. After a week, members of the public got to vote daily for which celebrity they wanted to remain. The celebrity garnering the lowest number of votes was eliminated, until eventually only one remained. Despite a suspicion that people didn't understand this and were voting for whom they wanted to leave rather than for whom they wanted to stay, it was nevertheless a huge success. The eventual winner was aging DJ Tony Blackburn, who beat flaky rich girl Tara Palmer-Tomkinson in a thrilling finish. I wondered who had been ahead after the first round. A seasonal letter. I saw my opportunity to get something published on Christmas Eve, and took it. A week earlier, a vicar had had the audacity to tell a bunch of three-year-old children that Father Christmas, aka Santa Claus, didn't exist. He cited scientific proof that anyone moving as fast as Father Christmas would burn up in the atmosphere (while presumably rejecting scientific evidence that virgins can't give birth). A letter on Christmas Eve Eve referred to this story, and I pounced. Santa's speed and another story are perennial favourites at this news-starved time of year; this is what I wrote to point out. Some 5 years after my first letter about Israel and the Eurovision Song Contest, I managed it again. This time, it was in response to the feeble excuses wheeled out to explain why the UK entry came last with 0 points, in particular that it was a reaction by the people of Europe to the UK's participation in the recent war against Iraq. It wasn't: the reason we received no votes was because our entry was sung completely and painfully out of tune. The Independent is a broadsheet newspaper: each page is twice the size of that of a tabloid. This is UK newspaper code for "quality" - there's no manufacturing reason why any newspaper couldn't be printed in tabloid format as easily as broadsheet. Because not everyone can physically hold a broadsheet, however, The Independent 's management made the decision to bring out a tabloid version as well. Other newspapers have switched from broadsheet to tabloid in the past, but this is the first time in the UK that we've had a single newspaper printed in both formats. The only concern I had that my letter on the subject might not be published was that someone else would beat me to it. Three days earlier, The Independent had carried an article about the goings-on at The Sims Online concerning issues of censorship (the editor of The Alphaville Herald had been banned from playing). This was fair enough, but the leader column of the newspaper advised players of such games to "get a (real) life". I was incensed by this, and wrote to tell them so. I threw my job title at them in the hope it would help, although since they seem to think that Essex University is in West Bergholt I don't suppose it did. This letter led directly to my appearance on Radio 4's Today Programme the following Friday. After a what he regarded a poor display by Chelsea player Marcel Desailly, respected TV commentator Ron Atkinson criticised him roundly. He continued his criticism after the microphone was switched off. Unfortunately, this criticism included a term of racial abuse. Even more unfortunately (for Atkinson), his microphone was not actually switched off and a fans in the Middle East were privy to his somewhat unconventional views. Marcel Desailly is <insert current acceptable word to mean someone who has very, very dark skin>; he is also <insert current acceptable term to mean someone who is a native of France>. I wonder if, had Big Ron been more discerning in his choice of racist invective, would he have been censured? The day before, The Independent had put on its front page the results of 10 requests it had made under the new Freedom of Information Act which had, for various (mainly spurious) reasons, been turned down. Mine was one of five letters published on the subject; I wrote it because I noticed that three of the explanations given claimed that to retrieve the information would be too expensive. Having read at least 4 interminable articles on what to do to get away from the World Cup, I decided to take action. An article in The Independent a few days earlier was critical of the way that Moslem women dress. There then followed a debate in the letters column that trotted out all the usual theological/libertarian arguments about whether it was a good thing or a bad thing, none of which took account of the social pressures involved. I thought I'd point this out, without actually saying anything in favour of the practice or against it (although, for the record, I'm against it). The original letter was edited down, but not enough that it's likely to enrage fundamentalists on either side of the argument. Oh, and the title is appropriate for the first letter of the day on the subject; mine was the third (of five). The previous week, The Times gave away a free DVD with a trial version of World of Warcraft on it. I wrote a letter of support; some other people wrote letters of condemnation. The result was this "Feedback" column. The previous evening, England had been knocked out of the European Championship qualifiers by losing 2-3 at Wembley. As a result, Steve McClaren lost his job of 18 months, pocketing £2.5m in the process. It seemed to me that the FA was being a little naïve in their approach. This was my first letter in The Guardian following my switch to it from The Independent. The following letter sent to Science Fiction magazine InterZone , rather than a newspaper. This was a reply to a letter bemoaning the fact that publishers only want to publish people who have already been published, ignoring available statistics from libraries indicating what people enjoy reading. The Write Angles scheme mentioned was closed down a few years later due to the expense of running it (or some other such flimsy excuse). The novel I submitted to them was INsightflames . This one appeared in Knights of the Dinner Table . After a few letters from other people in previous issues discussing weird objects like 7-sided dice, I resolved to reveal a solution I'd come up with in the 1970s for making dice with any reasonable number of faces. This is a photo submission to Viz . Viz is a kids' comic for grown-ups. It's packed with foul language, its cartoon strips are in very poor taste, and I've been reading it since issue 9 (I started with issue 2 but didn't see another copy for over a year). One of the regular features they have is their "Arse Gallery", which is basically a collection of photos (sent in by readers) of people with vast backsides. 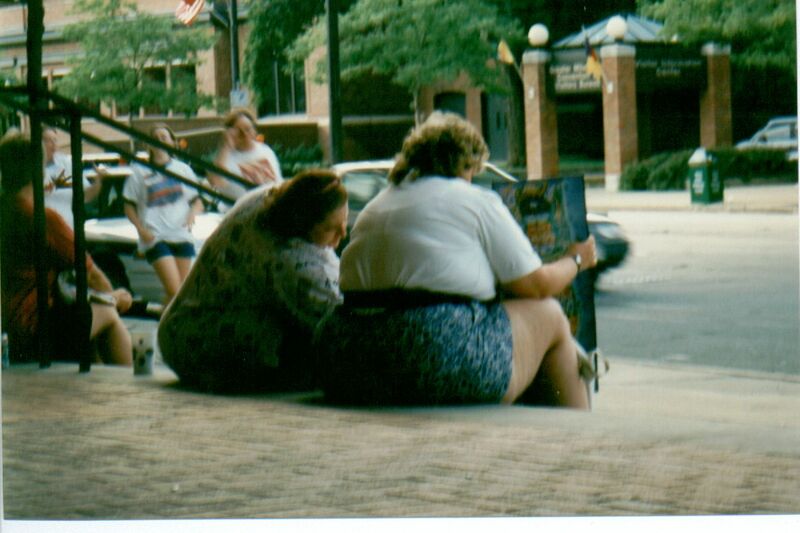 As a regular visitor to GenCon in the 1990s, I have many photographs of people who fit this description; this one doesn't show faces, so I figured it was OK to use (although Viz still blacked out a set of eyes, for effect). The Viz image is a little small, so here's a larger scan (135K) of the rumps in question.